Nyarugusu Camp, Tanzania –More than 100,000 Burundians fleeing renewed political violence in their country have poured into neighboring Tanzania since April. They knew they would be safe here; many had sought refuge in this country before. But there was no convenient place to put them. They couldn’t stay on the small peninsula in Lake Tanganyika to which the first 30,000 of them initially fled and where overcrowded conditions cause a brief cholera epidemic and 31 deaths. Brought by boat, 600 at a time, they landed in the lakeside town of Kigoma, where the United Nations refugee agency (UNHCR) registered them and then drove them here by bus. But Nyarugusu camp was full. More than 63,000 refugees from the Democratic Republic of Congo have been living in this densely packed area for almost two decades. So the new arrivals piled into the churches, schools and other buildings of the existing camp while UNHCR and partner humanitarian organizations hurried to put up tents, dig pit latrines and establish a new temporary camp next door. This is the latest chapter in Tanzania’s ongoing role as a major destination for refugees. The country currently harbors 160,000 refugees as well as 162,000 former refugees from Burundi who were naturalized after more than 40 years in Tanzania. In the 1990s, the refugee population in Tanzanian – from Rwanda, Burundi and Congo – soared to more than 1 million. The numbers are bigger in the Middle East, where civil war has driven 4 million Syrians into neighboring countries and displaced 7.6 million others inside the country, in Afghanistan, where more than 5.8 million people have returned from long periods as refugees, and in Europe as migrants have flooded in this year. But the complexity and duration of Tanzania’s protection for refugees stands out. The country harbors people at all stages, from newly arrived to newly naturalized to more than 30,000 who are preparing for permanent resettlement in the United States. Tanzanian and United Nations officials sought a permanent location for the new arrivals, in part because of concern that tensions could arise between the long-time refugees and the new arrivals. Elected leaders of the Congolese refugees who have been living here for two decades said they welcomed the new Burundian refugees into their churches and schools, and shared their own food and clothing with them. Camp president Abilola T. Angelique said the situation was inconvenient for the Congolese, especially the children who were about to take school examinations when the influx began, but that the refugee community was proud to aid those in need. The leaders were distressed that some news reports said there were ethnic tensions between the Congolese and the Burundians; they said there were no problems. Mends-Cole said there had been some concerns but that the Congolese worked hard to help the new arrivals, even slashing long grass in the moonlight to clear fields where tents could be set up. Three schools remained open for students to take their tests. Jerry Bailey, deputy country director for the UN World Food Program in Tanzania, said that humanitarian agencies anticipated new refugees would arrive from Burundi once a political dispute broke out in that country over the president’s plans to seek reelection. But, as often happens, the influx came with surprises. In this case, people crossed not by the land routes they had taken in the past, which were blocked by security forces, but by crowding onto a peninsula in Lake Tanganyika that has no road connection to the rest of Tanzania, UN officials said. Most brought food and clothing with them. Hunger wasn’t the problem; crowding was, because it led to highly unsanitary conditions and a cholera outbreak. Quick action by UN agencies and local partners halted the outbreak at 31 deaths among a population at that time of about 30,000. The only way to get the new refugees to a safe location was by boat – specifically, the century-old Motor Vessel Liemba, built by Germany and brought to the lake in 1913, when the country was a German colony. The Liemba carried 600 people per trip but could make only two trips per day (at a cost of $10,500 per trip) because of the time needed to load and unload passengers, UN officials said. Later a cargo vessel that could carry 300 refugees came into service. It took many days to bring the people to the lake port of Kigoma to be registered as refugees, treated as needed for medical problems and bused here to Nyarugusu, about four hours’ drive away in a remote area of northern Tanzania. UNHCR and other humanitarian organizations had erected thousands of tents in the fields on either side of the approach road to Nyarugusu camp by the time of a recent visit. Long rectangular tents housed dozens of people. Each of the smaller oval tents was divided into two sections and housed two families, about 12 people in all. Some refugees were hired to dig pit latrines according to UN specifications. Tanzanian farmers whose fields were being taken over harvested their cassava tubers as rapidly as they could even as the Burundians poured in. Hundreds of people waited for supplies – soap, buckets, sleeping pads, blankets and cookware – handed out by staff of UNHCR and Tanzanian Water and Sanitation, a local nonprofit group. Many refugees would have to return another day, despite hours of waiting in the hot sun, because it was not possible to serve all in one session. Christina Msonge and Eva Damas, both legal officers with the International Rescue Committee who specialize in gender-based violence issues, went tent-to-tent to check on whether the families had any acute problems and whether the unaccompanied minors placed in some households were looked after properly. The refugees they encountered included twin brothers, both at university in Burundi, who had fled without their family, a girl who ran in terror at the sight of visitors and elderly people trying to care for a collection of young children. A few refugees had brought small solar panels that they propped against the tent stakes so that they could recharge their cell phones. With no schools available, crowds of children wandered about, thronging aid workers and visitors, looking for something to do. Timotheo Masanyiwa, an International Rescue Committee staff member, found two soccer balls and a whistle, divided the boys into teams and launched a soccer match on a trampled field. Some children climbed nearby trees for a better look. Others carried bundles of sticks to their tents for cooking fires. The city of white tents emblazoned with the blue letters UNHCR contrasted with the established camp, where 63,000 residents live in mud brick houses with thatched roofs. That section of the camp has health clinics, schools built of bricks and metal roofs, and 87 churches. Numerous UN agencies as well as international and Tanzanian nonprofit organizations provide services there, although international funding for the camp has declined over the years, according to UNHCR. Sospeter C. Boyo, the camp’s top Tanzanian official, or commandant, said that Nyarugusu has been “overwhelmed” by the doubling of the refugee population, which is now 130,000, by UNHCR count. He said his duties include law enforcement as well as monitoring the work of all these aid organizations, known as implementing partners. “If the implementing partner messes up, it is our responsibility,” he said in Swahili, the Tanzanian national language; a UN staff member translated. “It is the responsibility of the government to provide land free of charge” for the camp. Tanzania has accommodated refugees since its first years of independence in the 1960s. President Julis Nyerere, founding father and a revered proponent of pan-Africanism, viewed refugees as foreign guests, especially if they were activists seeking independence for African colonies. The 162,000 Burundians who have been granted citizenship during the past year arrived in the 1970s, fleeing genocide in their homeland. Nyerere’s government gave them vast acreage in national forests to establish their homes and farms. In the 1990s, when genocide in Rwanda and civil wars in Burundi and Democratic Republic of Congo engulfed the region, Tanzania accepted nearly 900,000 new refugees. The policy had changed – they would live in camps where the international community provided aid – but the borders were open. Tanzania remained vigilant to prevent the violence that had spawned waves of refugees from crossing the border with them, as had happened in eastern Congo. In 1995, it closed its border to a new wave of Rwandans. But that proved to be an exception in Tanzanian policy. 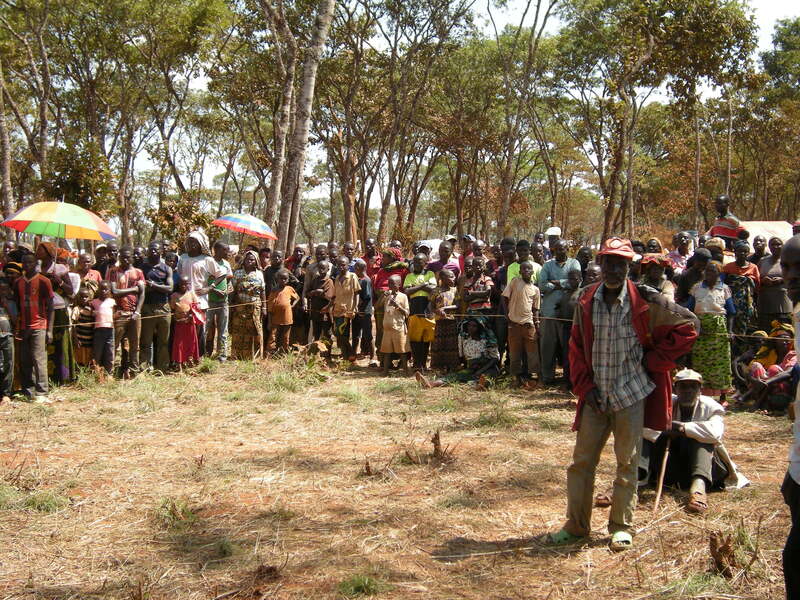 The crises of the 1990s left Tanzania with 12 refugee camps in the northwestern region. By 2012, the government had decided it was time, and conditions were safe enough, for most of the people to return home. It closed 11 camps as tens of thousands of Burundians repatriated, but it allowed those who remained in danger, including the majority of the Congolese, to remain. Mends-Cole, the UNHCR country representative, said a large portion of the Burundians who have arrived since April had been refugees in Tanzania at least once before. Now about 34,000 of the 63,000 Congolese at Nyarugusu are set to resettle in the United States. Boyo, the camp commandant, said the process will take five years or more. The Congolese refugee leaders in Nyarugusu said the 34,000 among them who are preparing to go to the United States were screened, with priority given to those who face ongoing threats in Congo because of their political activities. The leaders said their own hopes for durable solutions rest on those who will resettle abroad. Luoci M. Delas, first vice president of the Nyarugusu refugees, said that every milestone of his life – from birth to marriage to the birth of his first child to his arrival in the camp – has been marked by violence in his native Democratic Republic of Congo. His hope, he said, is that those who are moving to the United States will get a good education, and then come back and make peace in Congo so that all of them can go home safely. Also published on Huffington Post and Tutawaza.com, on Oct. 27, 2015.